WILSON RILEY BINGHAM was born July 1889 in Milam County, TX, and died June 19, 1958 in McCulloch County, TX. He was the fifth child born to James Riley Bingham and NANCY ARMINTHA JANE BARKER. 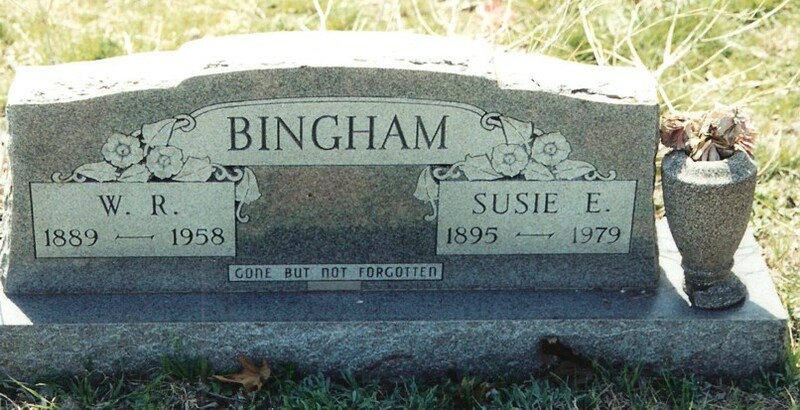 He married Susie Elizabeth Smith Feb 4, 1912 in Brady McCulloch County, TX. She was born May 05, 1895 and died December 02, 1979 in Marshall, Harrison County, TX. Joe Dale BINGHAM b. October 23, 1917, McCulloch County, TX; d. March 16, 1979, Kerrville VA Hospital, Kerr County, TX. Census: 1900 Census Milam County TX.